Many of us worry a little before meeting new people, yet soon relax and can enjoy new situations. However, some people become very anxious in social situations. They just can't relax and try to avoid being with people. Social anxiety is a persistent fear of social or performance situations in which we face unfamiliar people and the possible scrutiny or judgement of others. A person with social anxiety typically fears they might do something that would be embarrassing or humiliating. This fear can provoke anxiety, possibly panic. Realising the fear is irrational makes little difference. Feared situations might be avoided entirely or endured with stress and anxiety. Although most people feel a little anxious before meeting new people or when making a presentation or a speech, in social anxiety the anxiety or avoidance is so strong that it interferes with people's lives. A person's routine, work, social life or relationships can be affected. They may live in fear of having to face a situation in which they might be judged or be the 'centre of attention'. For a diagnosis of social anxiety, this fear, anxiety, or avoidance must have been present for more than six months. The socially-anxious person may feel very anxious if they have to make 'small talk' with others or interact in a group. The anxiety becomes worse if they fear that they are going to have to speak out, if they think they're going to be singled out, or if they think they're going to be being ridiculed, criticized, embarrassed or belittled in some way. This type of anxiety is often worse when the person feels the centre of attention or under the scrutiny of others. People with social anxiety can find it terrifying to interact with unfamiliar people, give a presentation, or even simply 'stand out' in some way. The person with social anxiety is sometimes seen as 'quiet', 'shy' or 'introverted'. They may be concerned that other people will notice their anxiety and that they will be humiliated or embarrassed as a result. They may come to fear the signs of anxiety; the quaking voice, the shaking, the blushing and sweating. Many people affected by social anxiety have jobs that are beneath their capabilities because they fear job interviews, or fear being in a position where there is too much public contact, or fear being promoted to a position where they would somehow feel more 'exposed'. If socially-anxious people isolate themselves and manage to avoid work and friends, their social circle can shrink until they have almost no contact with other people at all. For people with social anxiety, fears concerning social situations exert an undue influence over their thoughts and behaviour. Thinking about social situations is stressful and sufferers may spend a good deal of time thinking about how awful social situations will be - we call this 'anticipatory anxiety'. To escape the anxiety, some people turn to alcohol or recreational drugs to help them cope - which can become a problem in its own right. So commonplace is 'binge drinking' in some cultures that people may find they can hide behind it, preferring to be appear drunk than admit their social anxiety to others. A 'specific' anxiety affects people in a clearly defined area of their lives. For example, fear of public speaking (glossophobia) commonly affects people who have to perform or speak in front of others. Salesmen, actors, musicians, teachers or union representatives may all suffer from glossophobia, either regularly or from time-to-time. They may find they can socialise quite easily. However, when they have to talk in front of others they may become very anxious or 'dry up' completely. Some people find their throat closes up, making speaking very difficult indeed. Even experienced public speakers can be affected. At its worst, it can make it almost impossible for the sufferer to speak in public at all. Some people experience a painful 'lump in the throat' when they're anxious that makes talking difficult or painful - this is sometimes known as 'globus hystericus' or simply 'globus'. Other common specific social anxieties include paruresis or 'shy bladder syndrome' (an inability to urinate in public); the inability to eat in public (sometimes called 'sitophobia') and severe 'stage fright' or performance anxiety. People with panic disorder have intermittent high levels of anxiety together with physical symptoms that may lead them to think they have a physical health problem. Socially-anxious people have intermittent high levels of anxiety in social situations that lead them to avoid people and situations because of the anxiety it causes. They don't usually think the anxiety is caused by a medical condition. Unlike people with social anxiety, people with panic disorder and agoraphobia are often very sociable, and will, in the right circumstances, often seek out the company of other people. The term 'agoraphobia' was coined by the German psychiatrist Carl Friedrich Otto Westphal, from the Greek for 'large public square or marketplace'. Agoraphobia and social anxiety are different in that people with agoraphobia may avoid situations because of the fear of panic attacks, not because of the fear of social interactions. Continued avoidance can stem from social anxiety as people continue to cut themselves off from others due to the fear of social interactions, not from the fear of having a panic attack. It is possible for a person to have the symptoms of multiple anxiety disorders, although one will usually prevail. For example, a person with panic disorder may also be socially-anxious concerning different life situations, such as fear of public speaking and fear of being assertive. It is also possible for a person with one of the anxiety disorders to develop another disorder at a different time during their life. It can be seen how diagnosing an anxiety disorder can be quite complex and is best left to a trained professional. Social anxiety is probably the most common of all the anxiety disorders. We might get a dry mouth, sweat a lot, have palpitations (the feeling that the heart is beating very fast or irregularly) and want to use the toilet. Other people might be able to see some of the signs of this anxiety, such as blushing, stammering or trembling. The idea that other people can see the symptoms and might be judging us is acutely embarrassing, and some people 'implode' into shame and painful self-recriminations as a vicious circle begins. Sometimes we may breathe too fast, which can cause feelings of numbness or 'pins and needles' in our fingers and toes. This might feel quite alarming and can make our anxiety even worse. 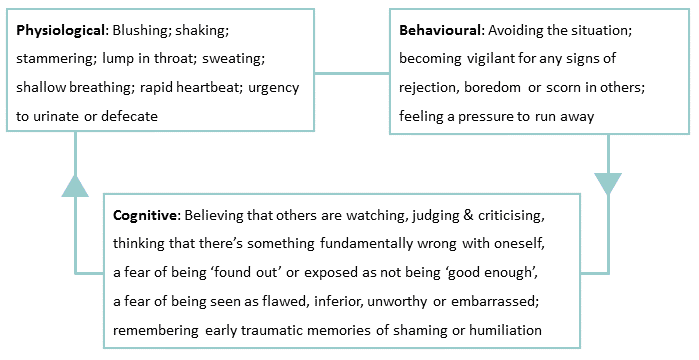 The experience of social anxiety can be thought of as comprising cognitive components - what we think and remember; physiological components (how we feel in the body) and a behavioural dimension - what we do (see figure 1). We don't know for sure, but it's likely to be a combination of things. Our genes, our life experiences, life circumstances and our outlook on life all play a part. The roots of social anxiety can sometimes be found in the experiences we have had in our early childhood or adolescence. What early experiences did you have that might have contributed to the way you think and feel about yourself? Take a bit of time to jot down a brief description of those experiences. People with social anxiety can find their mood lowered and their self-confidence being eroded if they lose contact with people and become excluded from community, social and work events. Depression can result. A person can develop social anxiety if they are bullied or intimidated at work, are in an abusive relationship, experience prolonged stressful life events, traumatic events, or have life-altering illnesses or injuries. Have you had any of the above experiences that might have negatively affected how you see yourself? Social anxiety can be a problem in its own right and, for some people, can lead to or exacerbate other problems - it can increase the risk of depression, eating disorders and low self-esteem. If you think your anxiety is caused by, or is causing other problems such as low self-esteem or depression, or if it's leading you to avoid work or social commitments, it's best to seek a professional opinion.